Andrew Jackson was born in the Waxhaw area of the Carolinas. His mother was visiting with her sisters at the time, and no one knows for sure which sister's house was the actual birthplace. Both homes were near the NC-SC border, one on each side of the line, by current reckoning, anyway. 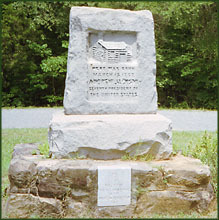 The markers pictured above are at the two most popular Jackson birth sites. Click on each for larger pictures. Jackson did spend a significant portion of his young life at the plantation in South Carolina, so it is reasonable for him to have considered himself a South Carolina native. 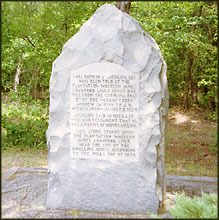 There is a state park at the South Carolina site just off of US 521 south of Charlotte, NC. It's worth a visit, particularly when the museum is open. The NC site is harder to find and has just the marker pictured here.